American Renaissance :: International Portfolio :: PRO IT Service S.R.L. - Choose a professional and accessible service for your online image! 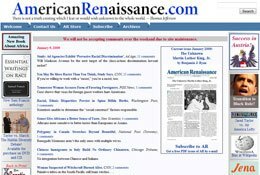 American Renaissance came to us saying that they need a faster server, to upgrade to movable type v4.23 and some more work. 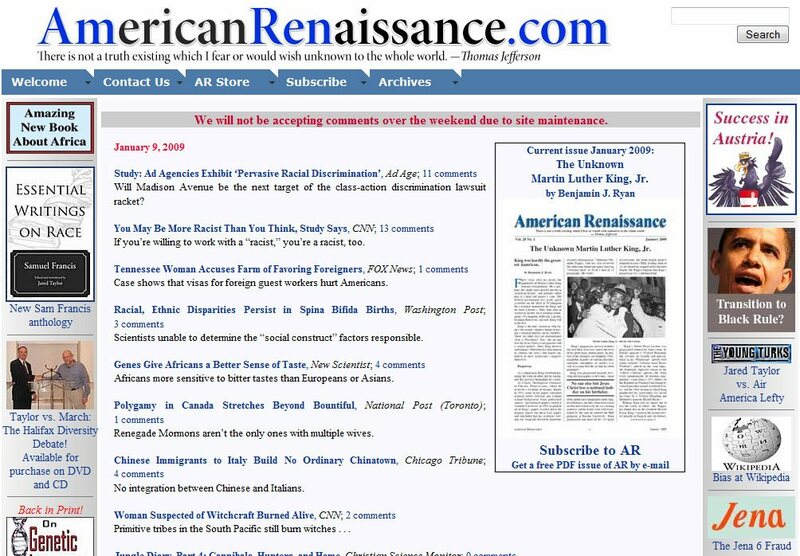 I've welcomed American Renaissance to join the network of Movable Type Web site projects I'm personally hosting in partnership with Pair Networks, Inc.
We are having an excellent collaboration with the crew behind American Renaissance (www.amren.com) since way back in February 2007. Among the work we've done together, which includes also movable type development work, worth mentioning is that we are also hosting another web site project for them. Happy about the movable type hosting service we've offered them for their http://www.racquetsportsindustry.com/ Web site project, this time American Renaissance wanted us to host their main Web site project. We're having trouble with the speed of our dedicated server, we need to upgrade to MT 4.23, and have some other MT and MySQL work done. We currently have about 12,000 entries and 45,000 comments in one weblog, and we add about 20 entries M-F. I've been deleting comments older than six months just to keep the system from melting down. In a second, related blog, we're going to have about 2,400 entries with no comments, adding about 20 entries per month. As I'm always doing my best to server my customers as professional as possible, I've immediately replied to the American Renaissance web technician asking for some technical parameters such as the project size, bandwidth etc. and I've shortly made them an offer. Obviously, they've been very happy with this proposal and accepted it right away. Another assignment from American Renaissance was to upgrade their movable type installation from v3.34 to v4.23, and also port some custom work done on their movable type core installation files, mainly the custom fields they asked us to create way back in 2007. I've recoded those hacks for movable type v4.23, upgraded the installation and ported also the other items, such as the movable type plugins amren.com needed. An important assignment I've got for amren.com was to recode their templates from the movable type v3.x architecture to the movable type v4.x architecture. Doing this work wasn't something uncommon for me, but just a question of time. Then, I've been asked to do some other work on the mysql database, mainly moving some data across from some fields to another and updating the movable type templates to reflect these database changes. As the work I've done for this project didn't include any design work or other developments than the movable type work mentioned above, I've decided to only take a main page capture for now. If you want to see the Web site in action, just go to www.amren.com.